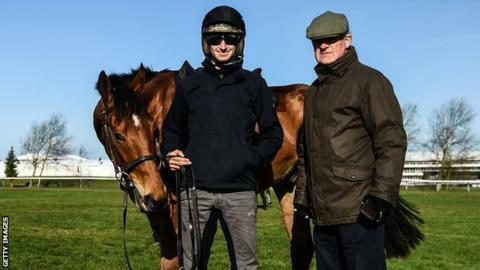 The Willie Mullins-trained Ballyward was fatally injured during the concluding National Hunt Challenge Cup on the opening day of the Cheltenham Festival. The 9-4 favourite fell at the 17th of 25 fences and had to be euthanised. The four-mile contest, which was restricted to amateur riders, saw just four of the 18 runners finish on the soft-going ground. Ballyward was one of nine fallers in the race, while five were pulled up. A spokesman from Cheltenham Racecourse said: "Sadly Ballyward sustained an injury in the National Hunt Chase. "They were immediately attended to by our vet team, who very sadly determined that it was necessary to euthanise them on welfare grounds. "As animal lovers, we hate to lose any horse and of course we shall review this incident. "Our thoughts are with the Ballyward's connections." Jockey Finian Maguire, who parted company with the Jessica Harrington-trained Whisperinthebreeze at the 14th Fence, was taken to Southmead Hospital in Bristol for further checks. Maguire is the son of former Gold Cup-winning rider Adrian Maguire. New safety and welfare measures have been introduced at Cheltenham this year following the deaths of seven horses at the Festival in 2018. Among the changes, every runner at jump racing's showpiece meeting will have a veterinary check before racing for the first time. In addition, inexperienced jockeys will be told they must walk the course before riding at the four-day meeting. Four jockeys have been suspended and another rider faces disciplinary action over incidents on day one. Grand National-winning jockey Davy Russell was suspended for two days after favourite Hardline finished seventh in the Arkle Chase. A stewards' report said that he disobeyed instructions given to him by a vet and acted in an improper way towards a racecourse employee in the pull-up area afterwards as runners were still being assessed by the veterinary team. Three riders were punished following the National Hunt Chase after stewards effectively ruled they had carried on riding tired horses that should have been pulled up. Declan Lavery finished third on Jerrysback, and was given a 10-day suspension. Stewards said his mount had made tired jumping errors at the final two fences. Robert James was suspended for 12 days for his ride on Just Your Type, who fell at the final fence. Noel McParlan, the rider of Mulcahys Hill - a faller at the penultimate obstacle - was given an eight-day suspension. Post-race examination of the horses did not reveal any abnormalities. The suspensions are likely to be effective in about two week's time. Stewards also wanted to hold an inquiry into the ride of Damian Skehan on Clondaw Cian, the fourth of four finishers, but he had left the course and the hearing was adjourned to a later date. The suspensions handed out to amateur jockeys for keeping going in the National Hunt Chase when the stewards felt they should have stopped feels significant - even though one finished third. The recent official review of welfare measures at Cheltenham by the British Horseracing Authority, which expressed itself "extremely disappointed" by these incidents, contained a warning of a "material threat" to amateur-only races if the rules weren't adhered to. The thing here is that amateurs are at the heart of the Festival and of jump racing heritage as a whole - it's how it all started - and reducing their participation would prove highly controversial and enrage many parts of the sport.